Adolf Eichmann was the operational manager in charge of the logistics of making the ‘Final Solution’ happen. His job was to plan and coordinate the rounding up of Jews from across Europe, to strip them of their assets, and ship them to ghettos and death camps. At the end of the Second World War he took on another identity and went underground. In 1950 he used a ratline to escape Germany, travelling to Argentina, where his wife and three children joined him. Unlike other Nazis, he had not looted for his own ends and his life in Argentina was very modest. Initially omitted from the most wanted list, as the extent of his war crimes became clear, Eichmann soon rose to become one of the most sought after Nazis. By the end of the 1950s, however, the appetite to hunt down war criminals had waned, except amongst a dedicated group determined to see justice administered. When they received the news that Eichmann was living in a Buenos Aires suburb they agitated for action and in May 1960 a team of Mossad agents snatched Eichmann and smuggled him out of Argentina to Israel. There he was put on trial for crimes against humanity. Eichmann did not resist his capture, nor deny his crimes, but rather sought to argue that he had simply been carrying out his orders and duty. He was hanged in June 1962. 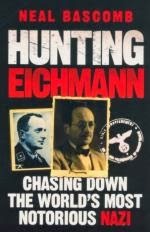 Hunting Eichmann focuses on the hunt for and capture of Eichmann, concentrating on the period from the end of the Second World War up until his arrival in Israel. As such, it sketches over Eichmann’s career within National Socialism and his activities during the war, and also his trial in Israel. In this sense, the book is very much about the search for him by various people and groups and the planning and execution of his capture by an Israeli Mossad team. Through extensive research, Bascomb produces a compelling narrative of how various events unfolded and all of the key personnel and their relationships and interactions. The result is a telling that has the feel of a novel, rather than a dry and detached history. 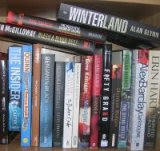 In particular, the reader gets a sense of the personalities and politics at play, and the wider resonance of Eichmann for Holocaust survivors. Personally, I would have liked a little more detail on Eichmann’s career and also the trial, but this is nonetheless a fascinating and well told read of how one of the most notorious war criminals of the twentieth century was brought to justice. Many people think Eichman went to Argentina but that has not been completely proved. Anyway, if you go to Argentina you have the chance to visit the Holocaust Museum and there is a lot of info there. The apartment in buenos aires I was staying in was close to it, in the neighbourhood of Coghlan. I like the way it is presented and you can learn many thinkg about nazis who escaped Germany when the World War finished. Some things were never released by the press!